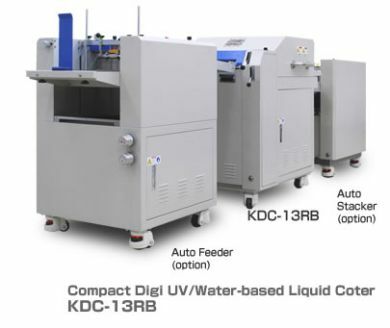 The compact Digi UV Coater 13RB is ideal for all types of small format digital press printers. From the innovative and visual touch screen, it is easy to monitor and operate both the feeder and coater functions. The top feeder is capable of accepting up to 200mm(8 inch) high stack of sheets and is ideal for running small to medium volume jobs. These allow operators to use not only UV coaters with different glossy and matte finish, but also UV coaters with optional texture rollers. Foot print is just 780mm X 700mm (without Auto Feeder).